This page briefly asks the question if brain stem activity is picked up on EEG. Answered by Dr. Adam Smith. The full answer can be found at https://www.healthtap.com/user_questions/1036730-does-and-eeg-pick-up-brain-stem-neuron-activity. Posted on 18th April, 2015 by T.A.O. to comments. Posted in HE/AE Links, members, Neurology | Tagged EEG, HE/AE Link, healthtap, T.A.O. Posted by T.A.O. on 21st April, 2015. Posted in Educational & Learning Aids, HE/AE Links, members, Neurology | Tagged auto-immune diseases, auto-immune encephalitis, CSF, HE/AE Link, PANDAS, Paraneoplastic Limbic Encephalitis, T.A.O. The full video can be found on Vimeo.com on the AE Alliance video page. The link was posted to comments by T.A.O. on 4th April, 2015. Posted in Auto-Immune, HE/AE Links, members, Neurology | Tagged AE Alliance, auto-immune diseases, auto-immune encephalitis, Gallentine, HE/AE Link, T.A.O. We are proud to announce our 100% silicone, non-allergenic medical alert wristbands. These wristbands have a colored, sunken area to be engraved with up to 80 characters of medical alert or emergency contact information. Priced at only $14.95 each including personalization, these are the lowest priced Medical ID Bracelets on the market today! They are extremely strong and will last for years to come. Unlike our Strong ID emergency wristbands which are not designed for daily wear, our new Medical Alert wristbands can be worn 24/7! We hope you like the new design and that you will tell your friends too! The website and information about medical alert wrist bands can be found at http://www.wristbandconnection.com/medical-alert.php. This link was posted on 18th April, 2015 by T.A.O. Many disorders of the central nervous system (CNS) previously considered neurodegenerative and untreatable are now recognized as having an autoimmune cause.1,2 Autoimmune disorders of the CNS may be paraneoplastic (occurring in the setting of an occult systemic cancer) or idiopathic. Improved recognition of these disorders has been facilitated by an expanding profile of neural-specific autoantibodies discovered and validated for clinical use in academic neuroimmunology laboratories. When detected in serum or cerebrospinal fluid (CSF), these immunoglobulin G (IgG) biomarkers reliably predict an autoimmune cause for neurological dysfunction in patients presenting with rapidly progressive brain disorders. New testing profiles relevant to the evaluation of 3 neurological disease states (autoimmune encephalopathy, dementia, and epilepsy) are now available from the Neuroimmunology Laboratory at Mayo Clinic, Rochester, Minnesota. Testing profiles, available for both serum and CSF, include neural antibodies that have been clinically validated as biomarkers of these 3 disorders. (Table 1) Negative results for these antibodies do not exclude an autoimmune basis for encephalopathy, dementia, or epilepsy, so in seronegative cases, a diagnostic trial of immunotherapy should be considered. 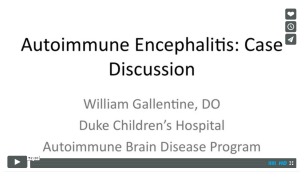 This The full comunique can be found at http://www.mayomedicallaboratories.com/articles/communique/2014/07-autoimmune-encephalopathy/index.html. This link was posted on 3rd December, 2014 by T.A.O. Posted in Auto-Immune, Educational & Learning Aids, Endocrinology, HE/AE Links, members, Neurology, Oncology | Tagged antibodies, auto-immune diseases, auto-immune encephalitis, auto-immune epilepsy, CSF, T.A.O.